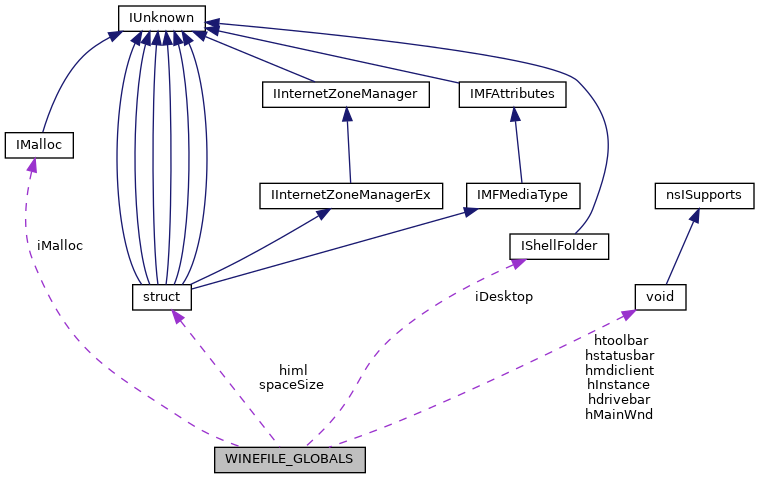 Definition at line 100 of file winefile.h. Definition at line 128 of file winefile.h. Referenced by fill_w32fdata_shell(), and InitInstance(). Definition at line 122 of file winefile.h. Referenced by create_drive_bar(), and FrameWndProc(). Definition at line 103 of file winefile.h. Referenced by InitInstance(), and wWinMain(). Definition at line 115 of file winefile.h. Referenced by create_drive_bar(), frame_get_clientspace(), FrameWndProc(), refresh_drives(), and resize_frame_rect(). Definition at line 116 of file winefile.h. Referenced by calc_single_width(), calc_widths(), choose_font(), create_tree_window(), ExitInstance(), init_output(), InitInstance(), load_registry_settings(), and save_registry_settings(). Definition at line 104 of file winefile.h. Referenced by InitInstance(), and show_frame(). Definition at line 120 of file winefile.h. Referenced by draw_item(), ExitInstance(), and show_frame(). Definition at line 102 of file winefile.h. Referenced by ChildWndProc(), choose_font(), create_child_window(), create_drive_bar(), create_header(), create_tree_window(), format_bytes(), FrameWndProc(), InitInstance(), load_string(), prompt_target(), show_frame(), and show_properties_dlg(). Definition at line 109 of file winefile.h. Definition at line 106 of file winefile.h. Referenced by create_drive_bar(), FrameWndProc(), refresh_drives(), save_registry_settings(), show_frame(), and wWinMain(). Definition at line 112 of file winefile.h. Referenced by activate_drive_window(), activate_fs_window(), choose_font(), create_child_window(), FrameWndProc(), resize_frame_rect(), show_frame(), and wWinMain(). Definition at line 107 of file winefile.h. Referenced by FrameWndProc(), and show_frame(). Definition at line 111 of file winefile.h. Referenced by FrameWndProc(), show_frame(), and toggle_child(). Definition at line 110 of file winefile.h. Referenced by FrameWndProc(), pane_command(), show_frame(), and update_view_menu(). Definition at line 113 of file winefile.h. Referenced by frame_get_clientspace(), FrameWndProc(), resize_frame_rect(), set_space_status(), and show_frame(). Definition at line 114 of file winefile.h. Referenced by frame_get_clientspace(), FrameWndProc(), resize_frame_rect(), and show_frame(). Definition at line 108 of file winefile.h. Definition at line 126 of file winefile.h. Referenced by ExitInstance(), free_entry(), get_path(), get_path_pidl(), InitInstance(), and read_tree_shell(). Definition at line 127 of file winefile.h. Referenced by ChildWndProc(), ExitInstance(), free_entry(), free_strret(), InitInstance(), launch_entry(), and read_tree_shell(). Definition at line 118 of file winefile.h. Referenced by init_output(), and output_number(). Definition at line 123 of file winefile.h. Referenced by read_directory(), and show_frame(). Definition at line 124 of file winefile.h. Definition at line 119 of file winefile.h. Referenced by calc_single_width(), calc_widths(), choose_font(), create_child_window(), init_output(), output_number(), output_tabbed_text(), and output_text().